Going to Bora Bora with kids? While Bora Bora is usually depicted as a destination for couples, it’s also a safe, fun-filled location, perfect for adventurous families. These tropical islands are some of the most beautiful, exotic, and remote places to visit in the world. Sharing this beauty with your children is a special experience that will forever be part of your story together. 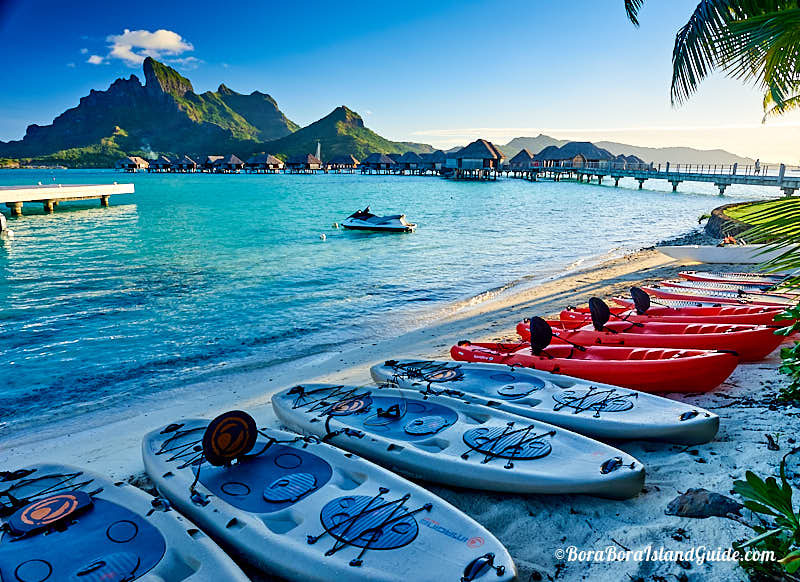 Bring the kids for a family vacation in Bora Bora and make some memories! Air Tahiti Nui is French Polynesia’s national airline, and has the most amount of flights to and from the international airport, which is on the main island of Tahiti. Special Tahiti family airfare deals come available from time to time. These offers can include one that allow kids to fly free or fly nearly free. The “nearly free” offer is the most recent promotion and along with 2 paying adults tickets gives 2 children’s tickets at only the cost of the taxes ($63-$122). While Bora Bora is not an “all-inclusive” destination; it is possible to get a great package that encompasses the most important aspects of your trip, such as meals, flights, and kid friendly accommodation. The best family vacation packages will include kids flying and staying free! You won’t find deals like this on the online booking engines, so it’s best to speak to a reputable Tahiti travel agent and get a quote for staying at one of the family friendly hotels in Bora Bora with kids. If you choose a family friendly hotel in Bora Bora you will find that there are plenty of free things to do at the resort. Mini golf, kayaking, paddle boarding, snorkeling, enjoying the swimming pool and beach, plus jumping off the over-water bungalow will keep your kids entertained for hours. The best family hotels in Bora Bora also have free kids clubs that offer coordinated activities and adventures, under caring supervision. If your kids are comfortable swimmers, make sure you book to take your tribe on a snorkeling tour out on the lagoon. By going on a boat excursion you can have unique experiences swimming with sharks, patting stingrays, and feeding thousands of colorful fish. You’ll have an even more extraordinary time if you book one that includes lunch on a motu (little island). Take a look at some of the best Bora Bora lagoon excursions and book before you go to get a better price than through booking with your hotel concierge. A wonderful way to capture the memories of visiting the world’s most beautiful island with your family is to have a professional photoshoot together. The photo shoot can go for as little or as long as you like (1 hour or more) to make it a pleasant experience for even the youngest family member. The photographer can come right to your resort, so it’s a hassle-free experience, and you will leave with some incredible photos of all of you together (rather than with someone gone-missing, behind the camera). If you stay at one of the top 4 Bora Bora kid friendly hotels meals-times will be easy. Breakfast consists of a large buffet of fresh and hot food that will have something to please even the fussiest of eaters. For lunch and dinner, a children’s menu is available with classic kids favorites, at pocket friendly prices. If you’re going to Bora Bora with kids and staying in budget accommodation on the mainland, you will want to eat where the locals eat at well-priced cafes and restaurants. The resorts in Bora Bora are a ready-made playground for both adults and children, but there are some items you can bring with to make the experience even more fun. If you are planning to snorkel in Bora Bora with kids it’s smart to bring snorkeling gear for each family member. This ensures they will have a mask that fits properly and is comfortable to wear. If you are staying at the Four Seasons Bora Bora resort, they provide child-sized snorkels, so if you are trying to cut down on luggage, or your kids won’t snorkel much, you can make use of the ones provided there. Flippers are not supplied by resorts but we highly recommend bringing them for snorkeling in Bora Bora’s coral gardens. If you are staying in an overwater bungalow, or a bungalow with a pool, it can be fun to bring some pool floaties with you. Most of them are light and compactly packaged, so if you can fit it in, bring a floating watermelon or pineapple along for the ride! Some of the resorts have started to provide floaties for guests to use. We know the Four Seasons and the St Regis do have some available so if you want to take your chance you can see what’s available when you arrive. Take extra sun protection, don’t rely on sunscreen. Ensure your kids have hats, cover-up shirts and rash vests for while they’re in the water. If your child is a water-baby and will want to spend time at the beach, not just the pool, you will want to get him/her a pair of reef shoes for going in the lagoon. The sandy lagoon floor can have a scattering of small pieces of broken coral or stones that can be tough on little feet.